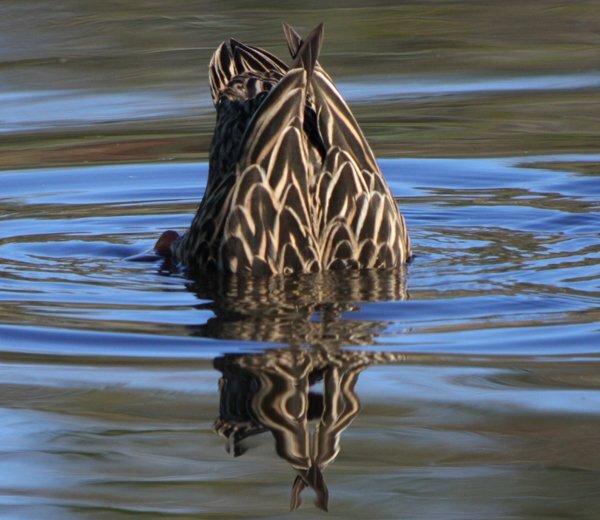 There really isn’t much to say about the Mottled Duck. It is one of several species in the Mallard-complex of ducks, along with American Black Duck, Mexican Duck, and quite a few others. You find them in the south from Florida to Texas and down into Mexico, occasionally as far north as the Carolinas in the east and up the Mississippi River as far north as Illinois. 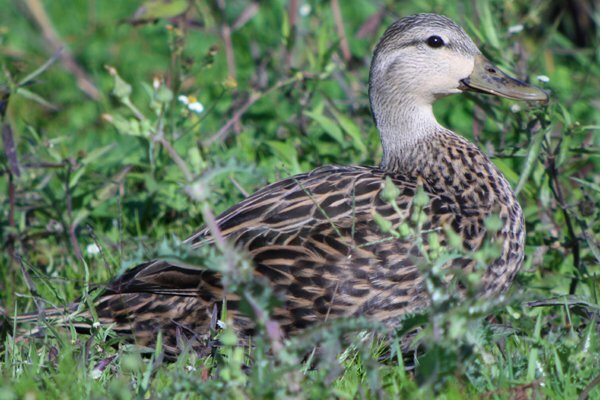 They are the only dabbling duck that regularly breeds in the marshes of the south and while they are a Species of Least Concern because of their large range and population, according to BirdLife International, there is concern that they will be genetically swamped by Mallards, with whom they readily hybridize. 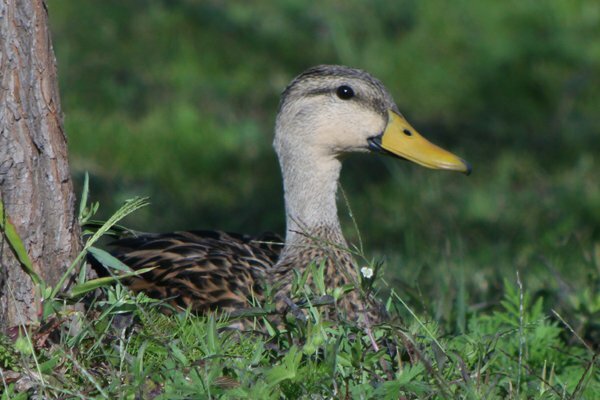 Essentially the Mottled Duck is the southern analog to the American Black Duck. It is a bland bird, built on shades of brown, and is basically boring. This means, of course, that we birders love them! Well, at least I do now that I have laid eyes upon Anas fulvigula. What’s not to like about a Mallard minus the snazzy colors? 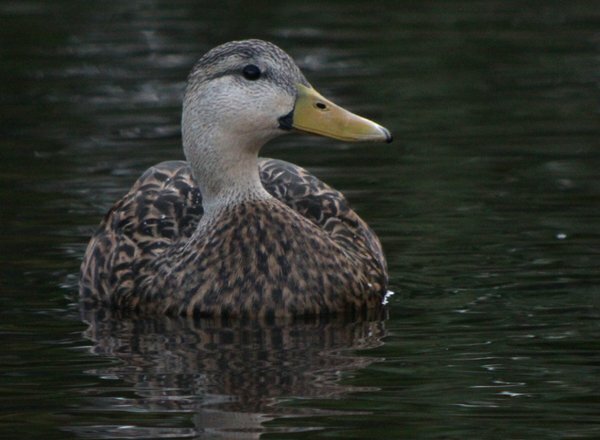 What the Mottled Duck lacks in color it makes up for in personality…no, honestly, that’s not true at all. I spent probably an hour-and-a-half watching Mottled Ducks during my time in Florida at the Space Coast Birding and Wildlife Festival and I didn’t see a single Mottled Duck do a single interesting thing. In fact, other than swimming around, occasionally quacking, and dabbling here and there I didn’t see Mottled Ducks do much of anything. I have pictures of all three of those activities though! Will the excitement never end? Now, what I found interesting is the idea that at least some of the birds in this blog post likely have at least some Mallard genes in them. Everyone who is knowledgeable seems to agree that a large portion of Mottled Ducks have Mallard in the family tree, even if most Mottled Ducks won’t admit it because they are ashamed. But I was unable to find any sure signs of Mallard characteristics in any of the Mottled Ducks that I spotted – maybe they are using cosmetics to hide their questionable ancestry? This might just be my unfamiliarity with the species speaking but I would be interested to see if anyone reading this post who knows these birds better than I is going to comment to tell me I am a dummy and one of these birds obviously has Mallard characteristics…and, now that I think about it some more that bird up above has a pretty bright orange bill. Does that mean anything? When am I going to end this annoying paragraph and go back to pictures? Not soon enough, that’s for sure! Mottled Ducks – they are so boring that the most interesting thing I can of to say about them is that I can’t figure out if any of the ones that I saw are hybrids. I hope you liked this blog post of questionable quality. Mottled Ducks. Blergh. Even more fascinating, the Florida Mottled Ducks and the Texas Mottled Ducks have a fair bit of genetic difference between them. So instead of one species of kinda boring Mallard-y duck, a good argument could be made that there are two. Thanks for the laugh. I suspect I, like most birders, love birds so much its hard to admit that some are just plain boring. Hard to get too excited over a mottled duck or brown headed cowbird. On a recent birding trip, almost everyone agreed that the worst lifer they ever had was Mottled Duck. I do honestly think that this is a very fine duck species, with its pintail-like elegance, and the amazing contrast between the pale head, the black spot at the chin and this beautifully intensive yellow bill. How can this possibly be “the worst lifer”!? Perhaps not the kind of lifebird that would compel me to take a hastily planned flight to McAllen and rent the last car at the airport to make sure i ticked it off the old lifelist, but when you live in a place where roadrunners are as exotic as chickens, even a Mottled Duck can get the heart racing. Where Are You Birding This Last Weekend of October 2008?